Hey y'all! It feels good to be back to posting somewhat regularly! My hubby got me set up with our old laptop so that I can blog while he's working at home now! YAY!!! lol! Today's recipe is a family classic from my childhood and I'm pulling it from the archives as I've recently re-made it and changed it up a bit! I honestly don't know where this recipe originated other than my Mom making it fairly often when I was young because I just loved it, (hence it's named after ME! haha!) and it's an easy and cheap meal to throw together. I honestly kind of forgot about this recipe until last week when my little Sis-In-Law was perusing my blog and found it and decided it must be made the very next day for lunch. My little sous chef just adored this and ate it up, my Sis got seconds, and I (being pregnant and suddenly majorly craving this) ate a lot more than I'd like to admit... HAHA! It reminded me of my childhood, and really was just an all around comfort food and with all the stress of the last few months it really hit the spot. Now I know this isn't the most figure friendly meal I've ever posted, so if you're wanting that feel free to check out another recipe. But it is cheap, easy and a big time kid pleaser. And also when I make Mac and Cheese I use only half the butter recommended and always use lowfat milk too and so far my boys haven't noticed... ;-) Enjoy! Cook Macaroni according to directions on package. Meanwhile in a skillet saute' onions and garlic in a little bit of Olive Oil. Once translucent, add the ground beef and 2 teaspoons Italian Seasoning and brown, once cooked drain the fat. 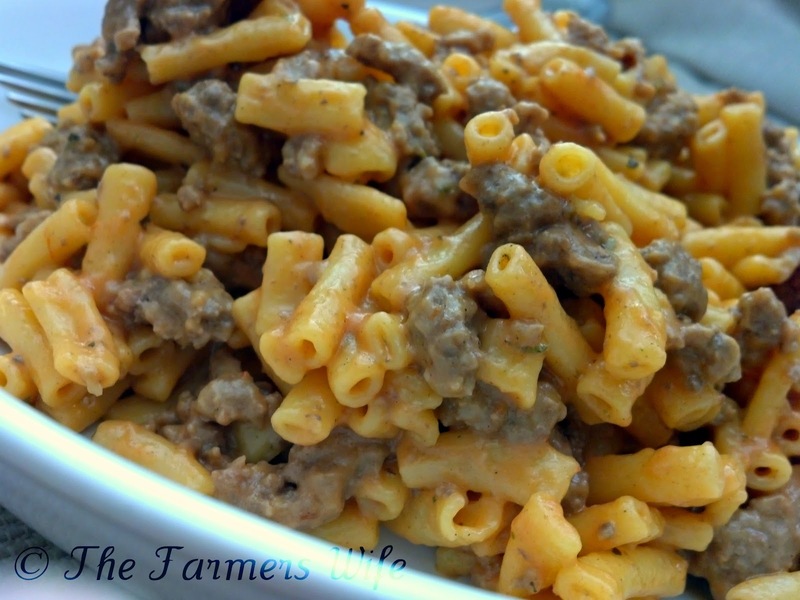 Add the beef to the cooked and prepared macaroni. Pour the tomato soup in the pot and mix. Add in the remaining seasonings (to taste) and stir. Makes about 6 servings. My son would eat the whole skillet full... so would my hubby! I think this is their stick to your ribs, yummy in your tummy kind of meal. :) Well done. Good to have you back with your laptop! I made something similar to this before and we just loved it. So much better than the box mix. I will try your version. I found you through Facebook and glad I did. This looks good. Better then the box mix. Well done. Welcome back!! Miss you and your wonderful postings.......... This looks EXCELLENT! !